Catriona Travers was born and grew up in Dublin, Ireland. She went to school and college there, but unfortunately had to drop out of University due to her first episode of manic depression - for which she was hospitalised. She came to London in 1988, where she took a succession of temping jobs leading to switchboard operator jobs in hotels and hospitals. Her last job was as a supervisor and switchboard operator in a North London hospital. 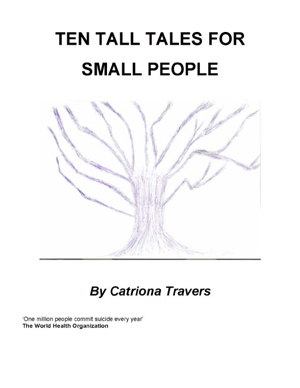 Catriona has always enjoyed writing; poetry in the eighties and a children's book in the nineties. Catriona also enjoys reading, tennis and drama. Carrie Caffrey blinked furiously at the shaft of sunlight streeling in spools through the window, and let the droplets of April's showers tinkle in tiny spangles on her out stretched palm. The nursery room was still and silent, perfectly peaceful. Her baby brother Jonathan was gurgling and giggling in his cot, and her mother Harriet Caffrey was adjusting the mobile that ran around his head. "My, my, Carrie, but you ARE blessed with such an imagination. Why on earth would you think that a tree could talk! Trees are not human, you know, dear, and I can assure you that they most certainly do not talk. Neither do they walk, sing, dance, or eat like humans do"
Carrie was in the hot soup again, as Mrs Crank, her schoolteacher had sent a note home, informing Mrs Caffrey of her daughter's imagination, which was a very good and fine for books and stories, but not when it distracted the class with her tales which were most certainly untrue. The matter was getting out of hand. The other children were beginning to believe her wild tales. They were here to learn, not compose fiction about trees that talked to young children. And Carrie informed her mother in an adult fashion that monkeys were not human, and they could sometimes talk, and apes too, and hyenas could laugh. Bart, her big brother, at that moment strode into the nursery and pulled a face. "Honestly, Carrie, you can be so stupid at times. Anyway, you're only four, so I suppose you'll be forgiven. So what does this terribly brilliant tree have to say for itself, then? Is it like Moses and the burning bush?" Carrie looked up from the toffee cake she was eating and stared blankly. "Who's Moses?" The chill of the early evening crept through the shuttered window and Harriet Caffrey fastened it gingerly, telling them to be sure and be washed and changed for tea. She bustled around the nursery picking up stray shoes and socks, smoothing her starched linen dress with her hand, which she always did when she was distracted or agitated. Today she was both. With one last warning glance, she quietly shut the door and went downstairs. "Go on, Carrie" said Bart "I'm all agog-- tell me all about your talking tree." Her hot and grubby tear stained looked at that moment quite comical to Bart. He did something which was most unusual for him. Re- gave her a whole bag of dolly mixtures, which was really out of the ordinary, as he usually guarded them like the crown jewels. "Well, I can't really tell you everything she says, but the first time she talked to me, she sighed and said that her arms ached, and then she waved one of her branches in the breeze. Then she said she was hungry, and would I be so kind as to throw a nearby pitcher of rainwater at her feet, so she could have some Coro- Coro-fill." "Chlorophyll, you mean," Bart said helpfully, feeling very important as he'd just learnt that today in his nature study class. Its a special kind of food that plants and trees and things produce that makes them go green. Oh by the way, how can you be sure that this tree is a she? It might be a man, I mean." I asked her that, and she sighed again, and said that she was of Mother Earth. Then she sheltered me from the rain, and asked me to stop by every day, as she was getting lonely, and would like a friend to share summer and autumn with. "So what do you talk about every day?" asked a very curious Bart. "Well, she tells me about how she settled roots in that piece of land and grew up there. She tells me not to bring anyone along, as she won't talk to them, "only to me." And with that Bart jumped down from the window ledge, and they both got ready for tea. After that, Carrie never again mentioned the tree, but she still stopped by to talk everyday after school, staying a little longer whenever it was raining. The tree certainly told some tall tales, but then it was a very tall tree. Sometimes she shed some tears from her bark if she lost some leaves, but mostly she was a happy tree. One day Carrie stayed a little longer than usual and noticed a cluster of birds had made a nest high up in the trees branches. Came addressed the tree. The tree didn't answer some of Came's questions and puzzled, Carried asked. "Because I am talking to this family of birds. I'm sorry, Carrie, you see the birds speak a different language, and I answer them silently in the tree talk. That's why you do not hear them. They are telling me that they have come from the south for the summer to nest and nurse the baby birds. They also tell me of howling winds and stormy weather that is making its way over here to cause havoc and thunderstorms. It is the enemy of nature, and that is why they fled over here. They tell me to warn you of this, as it will be one of the worst thunderstorms ever. They call it Harry the Hurricane, the first cousin of Sammy the Storm, and warn that it will be the worst in years. Well, of course, as you can imagine, the warning struck in Carrie a great sense of foreboding and fear. She felt it her duty to warn everyone of this perilous storm. Of course when Carrie got home from school that afternoon, her mother tut-tutted when she heard her news. "Now, Carrie, enough of that nonsense."